Our blogs are about MOVEMENT – moving better for our health and wellness and the well-being of our muscles and joints – and moving more for the same reasons. And let’s face it – MOVEMENT FOR MORE FUN! What we have found works for us are the practices taught by well-known author and biomechanist Katy Bowman (www.nutritiousmovement.com). This blog is about the book we recently co-authored with Katy. Although we would love to have you get a copy, the intention of this blog is to share our experiences as co-authors. Katy is a most generous individual and she has provided a bounty of free information on how her program works. So if you choose to skip the book for now and still want to learn more, check out Katy’s website generally. Of particular interest and value to us for the many years she wrote it before putting it to bed early this year, is her KatySays Blog which you can find under the Read icon by clicking on Blog. This is where we share the fun we have had (and continue to have) as co-authors of a book by biomechanist Katy Bowman. By clicking on the links below you will go directly to see what has happened thus far in our brief moments of fame on television on The Today Show, Los Angeles KABC Channel 7, and The List as well as on a KatySays podcast. In March 2017 our book, Dynamic Aging: Simple Exercises for Whole-Body Mobility was released. At one moment in time, I am told it was the #1 best seller on Amazon and to date it has sold more than 17,000 copies. (I understand the average sale for a new book is 2,000.) The book is available on Katy’s website and on Amazon at www.amazon.com. We had an official book signing in Ventura with Katy. She has an audio podcast Katy Says with Dani Hemmat (www.moveyourbodybetter.com). They interviewed the four of us at the book signing. Check it out at http://tinyurl.com/y9wwqg2q. First the producer came out and met with Katy and us at a local park where he filmed us climbing trees, hanging/swinging from bars, and playing on the kids’ equipment (we got some funny looks from the kids). 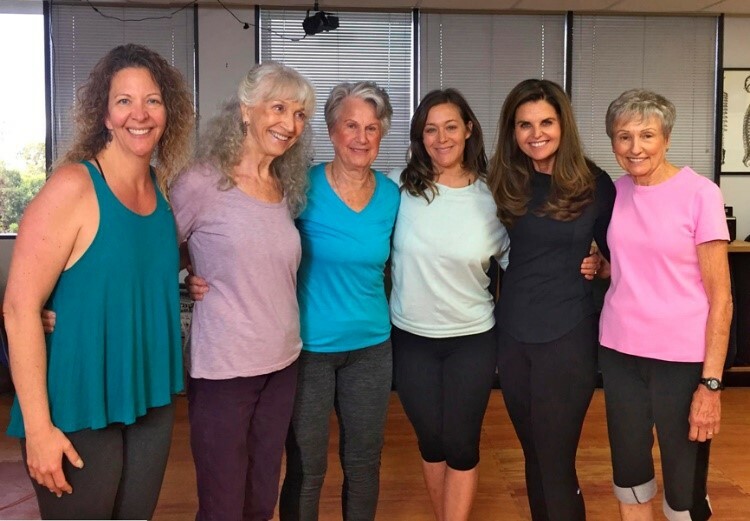 Then the show was filmed with Maria Shriver at the Ventura studio where I work as an instructor – the Alignment BEACH (Body Education Alignment Center for Health) owned by Restorative Exercise Specialist, Breena Maggio (www.alignmentbeach.com). This whole experience was AMAZING! Here we are left to right: Breena, Lora, Joyce, Katy, Maria and me. Shelah was on vacation. Then Los Angeles KABC Channel 7 Eyewitness News reporter Lori Corbin came out and filmed us with Katy in the studio. Check this video. Then we appeared on a show called The List where they incorporated footage from the video Moving (see Week/Blog #1) shot by Joyce’s granddaughter, Alice, here on our ranch. Prior to the book being published, Joyce’s granddaughter, Alice, had come out to the ranch and shot footage of the four of us septuagenarians hiking, hanging, climbing and enjoying our whole-body mobility. Subsequently, she put it into a brief video called Moving which can be seen on You Tube at https://www.youtube.com/watch?v=ysFpNODlqzg&t=7s. Our takeaway on all of this is that people, of all ages, are looking for more information on dynamic aging so they can live dynamically. That is what our blogs are about. For us, there are things in our lives we want to be able to continue to do. And we want to explore new possibilities. To travel, to climb trees, to hike long or short distances locally or in the national parks or in other lands, to garden while squatting, to climb ladders, to pick up and play with our grandchildren and great grandchildren, to hang and swing on the bars – maybe even to do a chin up or pull up. Or maybe it’s being able to do the various activities of daily living – bathing, toileting, dressing, eating, getting in and out of a car, sitting in and rising from a chair, walking across a room or upstairs, preparing our meals – independently or with minimal assistance. Isn’t that what we all want – to be independent as long as possible. In our collective experience, we believe the possibilities are unlimited. NOTE: As the book’s title says, these are “simple exercises.” Your regular practice and attention to detail will help you develop a daily awareness of where your body is in space so you can integrate the moves into your daily living. We have spent more than eight years following Katy’s practices. Our diligence in paying attention to the details and integrating this work into our daily lives is what has brought us to where we are now. We have experienced injuries along the way because we went too fast – tried things we weren’t ready for yet. 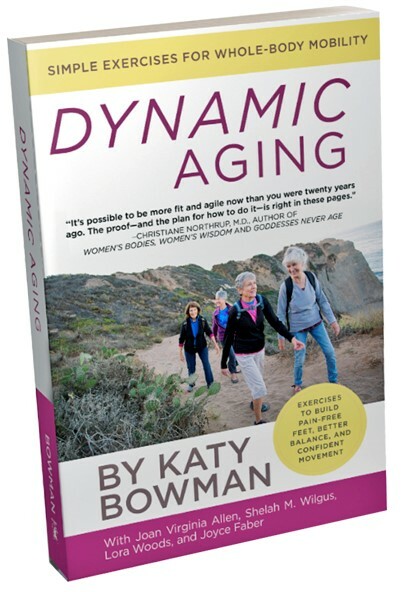 So, take your time and really learn the basics – from our book, Dynamic Aging, and from all the resources available at Katy’s website www.nutritiousmovement.com. This is more than an exercise program to be done an hour a day – it is a paradigm shift to help you dynamically live and age – starting at any age. Yea! Yippee! a blog that moves! excellent! I have read the book, excellent and very useful information. As we all age our bodies go thru a lot of changes, not the same, but just like when we are kids growing up. I look forward to future blog posts by all of these wonderful ladies. Thank you all for sharing your insight.